Still and video cameras have become significantly smaller and photo/video capabilities of smartphones are ever more sophisticated. Optical zoom capabilities on small video palmcorders and still cameras push the limits of telephoto optics. Digital zoom goes even farther but be careful because it can degrade the image. With all this ability to zoom in close with a very tiny camera, one major problem rears its ugly head, camera shake. The closer you zoom into your subject the more unstable the image becomes to the point where your video may give viewers motion sickness. Built in image stabilization reduces the problem but does not eliminate it. Most cameras will tell that shake is a problem. Stills taken in low light can suffer from motion blur if not held completely steady. Most cameras display a warning if shutter speed is too low and a tripod or flash is recommended. Optical image stabilization helps but not entirely. What if you don’t have a tripod and can’t or don’t want to use flash. Some alternative physical camera stabilization is necessary. That’s where HandlePod comes in. 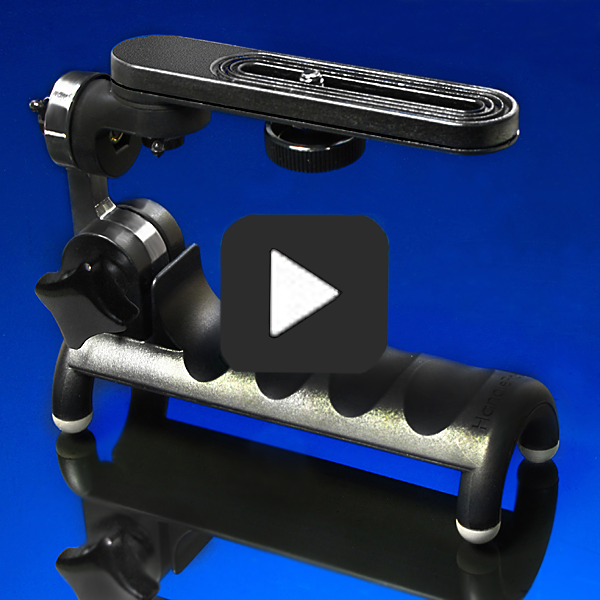 It is a handle that provides greater leverage and a firmer grip to stabilize any size camera to minimize motion shake. What’s more, it can be pressed by hand against any solid object for absolute stability and rock-steady stills and video. Anything can be used as a camera support regardless of size–a pole, a railing, a tree, a building–whatever you can press the HandlerPod against with your hand. With the HandlePod stabilized on any support you can zoom in as close as you want or shoot stills at any exposure without fear of dizzying video shake or photos with motion blur. This entry was posted in Tripod Alternative on October 22, 2014 by main user.